BOSTON – What a difference one letter can make. That’s what the title character in the ArtsEmerson production of “Hamnet” reminds us. It’s the difference, in his case, of the son of playwright William Shakespeare bearing the name of one of the most famous characters in literature or just becoming a forgotten footnote of history. In reality, Shakespeare’s son never lived to see his name altered to become the central figure in “Hamlet.” He died at age 11 in 1596, several years years before his father went on to write perhaps the best-known tragedy in Western literature between 1599 and 1601. Hamnet also had a twin sister named Judith but again, so little is known about her that she is also pretty much a blank canvas. Scholars speculate that Hamnet rarely or perhaps never even met his father, who left his family behind in Stratford-upon-Avon to find fame and fortune on the London stage. That gave free rein for the creators of “Hamnet” to work on a backstory and speculate about him, and they have taken advantage in the fascinating, often poignant and powerful production on the Robert J. Orchard Stage at the Paramount Center, co-written and directed by Bush Moukarzel and Ben Kidd of the Irish troupe Dead Centre Theatre. At a recent press performance the role of Hamnet was portrayed by Ollie West, who is 14 and has been playing the role for the past 18 months but is now “aging out” of the part and is portraying Hamnet for just the first part of the run, giving way to 11-year-old Aran Murphy. As the play begins, Hamnet wanders on stage convinced that we in the audience have knowledge and a feel for the Great Man who is his father and we can somehow help him to connect with his father. He appears to be what we would consider a normal pre-teen of this era in most regards: he wears jeans and a hood, carries a backpack, has a cellphone and uses Google to answer questions that come up. 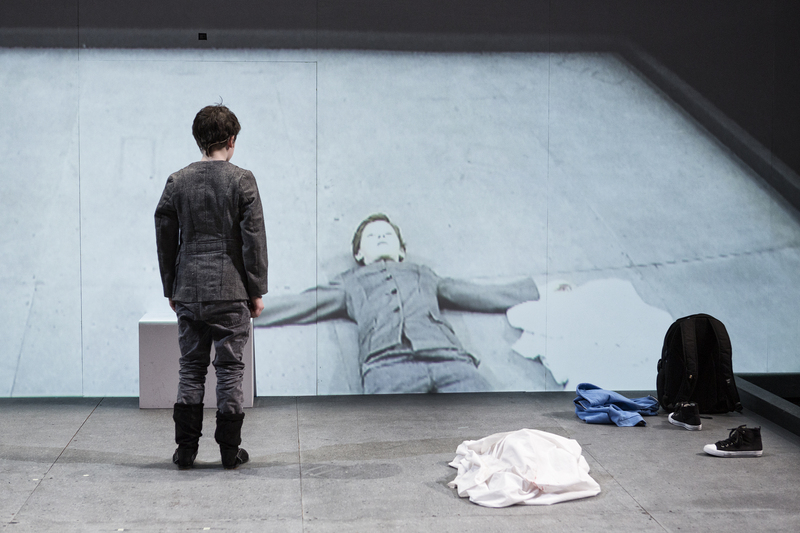 Hamnet channels the most famous of famous passages – the “To be or not to be” speech of “Hamlet” – dresses for the part and even invites an audience member onstage to work with him, play a part and become part of the portrayal. In its construction, this is an existential, metaphysical world, where the boy exists in an out-of-time place, the creators using video imagery, lighting, and sound design to add to the mood. Hamnet seems to have been 11 for a very long time and doesn’t quite show any signs of becoming something else. He tosses a ball against the back wall of the stage, and the image is reflected back at the audience, one of several behaviors he will repeat over and over. The Great Man himself will eventually shows up and becomes part of the proceedings and it is a mystical, magical moment, fraught with all the that you would expect in such a relationship. ArtsEmerson presents Dead Centre Theatre’s “Hamnet.” Written and directed by Bush Moukarzel and Ben Kidd. Sound design by Kevin Gleeson. Video design by Jose Miguel Jiminez. Lighting design by Stephen Dodd. Costume design by Grace O’Hara. Set design by Andrew Clancy. On the Robert J. Orchard State at the Paramount Center through Oct. 7. artsemerson.org.